Install latest version of R.
Install latest version of RStudio. Install additional packages using the packages tab. Install additional packages using R code. R is an open source programming language originally designed and implemented by statisticians primarily for statistical analysis. It includes high quality graphics capabilities and tools for data analysis and reading and writing data to/from files. Because R is open source and is supported by a large community of developers and users there is a very large selection of third-party add-on packages which are freely available to extend R’s native capabilities. R is a scripted language. Rather than pointing and clicking in a graphical environment you write code statements to ask R to do something for you. This has the advantage of providing a record of what was done and allows for peer review of the work undertaken. Having this written record, something which is increasingly required as part of a publication submission, is also an aid when seeking help with problems. There are many online resources such as stackoverflow and the RStudio Community which will allow you to seek help from peers. Questions which are backed up with short, reproducible code snippets are more likely to attract knowledgeable responses. To make it easier to interact with R, we will use RStudio. RStudio is the most popular IDE (Integrated Development Interface), to work with R. An IDE is a software that provide tools to make it easier to program. Let’s start by learning about RStudio, which is an Integrated Development Environment (IDE) for working with R.
The RStudio IDE open-source product is free under the Affero General Public License (AGPL) v3. 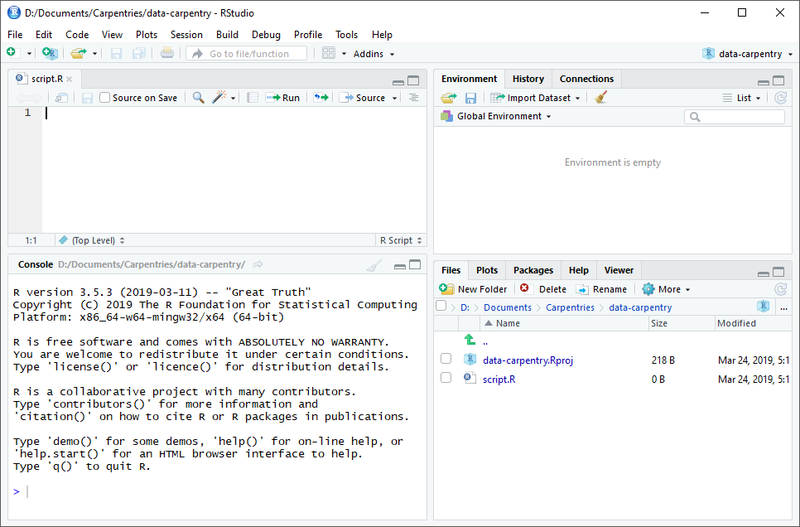 The RStudio IDE is also available with a commercial license and priority email support from RStudio, Inc.
We will use RStudio IDE to write code, navigate the files on our computer, inspect the variables we are going to create, and visualize the plots we will generate. RStudio can also be used for other things (e.g., version control, developing packages, writing Shiny apps) that we will not cover during the workshop. One of the advantages of using RStudio is that all the information you need to write code is available in a single window. Additionally, with many shortcuts, autocompletion, and highlighting for the major file types you use while developing in R, RStudio will make typing easier and less error-prone. RStudio provides a helpful set of tools to do this through its “Projects” interface, which not only creates a working directory for you but also remembers its location (allowing you to quickly navigate to it) and optionally preserves custom settings and open files to make it easier to resume work after a break. Below, we will go through the steps for creating an “R Project” for this tutorial. First let’s take a quick tour of RStudio. RStudio is divided into 4 “Panes”: the Source for your scripts and documents (top-left, in the default layout), the R Console (bottom-left), your Environment/History (top-right), and your Files/Plots/Packages/Help/Viewer (bottom-right). The placement of these panes and their content can be customized (see menu, Tools -> Global Options -> Pane Layout). Create a new file where we will type our scripts. Go to File > New File > R script. Click the save icon on your toolbar and save your script as “script.R”. Using a consistent folder structure across your projects will help keep things organized, and will also make it easy to find/file things in the future. This can be especially helpful when you have multiple projects. In general, you may create directories (folders) for scripts, data, and documents. data/ Use this folder to store your raw data and intermediate datasets you may create for the need of a particular analysis. For the sake of transparency and provenance, you should always keep a copy of your raw data accessible and do as much of your data cleanup and preprocessing programmatically (i.e., with scripts, rather than manually) as possible. data_output/ When you need to modify your raw data for your analyses, it might be useful to store the modified versions of the datasets generated by your scripts in a different folder. documents/ This would be a place to keep outlines, drafts, and other text. fig_output/ This folder will store the graphics that are generated by your scripts. scripts/ This would be the location to keep your R scripts for different analyses or plotting. You may want additional directories or subdirectories depending on your project needs, but these should form the backbone of your working directory. The working directory is an important concept to understand. It is the place from where R will be looking for and saving the files. When you write code for your project, it should refer to files in relation to the root of your working directory and only need files within this structure. Using RStudio projects makes this easy and ensures that your working directory is set properly. If you need to check it, you can use getwd(). If for some reason your working directory is not what it should be, you can change it in the RStudio interface by navigating in the file browser where your working directory should be, and clicking on the blue gear icon “More”, and select “Set As Working Directory”. Alternatively you can use setwd("/path/to/working/directory") to reset your working directory. However, your scripts should not include this line because it will fail on someone else’s computer. The basis of programming is that we write down instructions for the computer to follow, and then we tell the computer to follow those instructions. We write, or code, instructions in R because it is a common language that both the computer and we can understand. We call the instructions commands and we tell the computer to follow the instructions by executing (also called running) those commands. There are two main ways of interacting with R: by using the console or by using script files (plain text files that contain your code). The console pane (in RStudio, the bottom left panel) is the place where commands written in the R language can be typed and executed immediately by the computer. It is also where the results will be shown for commands that have been executed. You can type commands directly into the console and press Enter to execute those commands, but they will be forgotten when you close the session. Because we want our code and workflow to be reproducible, it is better to type the commands we want in the script editor, and save the script. This way, there is a complete record of what we did, and anyone (including our future selves!) can easily replicate the results on their computer. RStudio allows you to execute commands directly from the script editor by using the Ctrl + Enter shortcut (on Macs, Cmd + Return will work, too). The command on the current line in the script (indicated by the cursor) or all of the commands in the currently selected text will be sent to the console and executed when you press Ctrl + Enter. You can find other keyboard shortcuts in this RStudio cheatsheet about the RStudio IDE. At some point in your analysis you may want to check the content of a variable or the structure of an object, without necessarily keeping a record of it in your script. You can type these commands and execute them directly in the console. RStudio provides the Ctrl + 1 and Ctrl + 2 shortcuts allow you to jump between the script and the console panes. If R is ready to accept commands, the R console shows a > prompt. If it receives a command (by typing, copy-pasting or sent from the script editor using Ctrl + Enter), R will try to execute it, and when ready, will show the results and come back with a new > prompt to wait for new commands. If R is still waiting for you to enter more data because it isn’t complete yet, the console will show a + prompt. It means that you haven’t finished entering a complete command. This is because you have not ‘closed’ a parenthesis or quotation, i.e. you don’t have the same number of left-parentheses as right-parentheses, or the same number of opening and closing quotation marks. When this happens, and you thought you finished typing your command, click inside the console window and press Esc; this will cancel the incomplete command and return you to the > prompt. 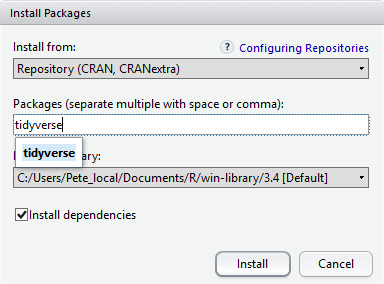 In addition to the core R installation there are in excess of 10,000 additional packages which can be used to extend the functionality of R. Many of these have been written by R users and have been made available in central repositories, like the one hosted at CRAN for anyone to download and install into their own R environment. In the course of this lesson we will be making use of several of these packages such as ‘ggplot2’ and ‘dplyr’. Additional packages can be installed from the ‘packages’ tab. On the packages tab click the ‘Install’ icon and start typing the name of the package you want in the text box. As you type packages matching your starting characters will be displayed in a drop down list from where it can be selected. At the bottom of the Install Packages window is a check box for ‘Install’ dependencies. This is ticked by default, which is usually what you want. Packages can (and do) make use of functionality built into other packages, so for the functionality contained in the package you are installing to work properly, there may be other packages which have to be installed with them. The ‘Install dependencies’ option makes sure that this happens. Use the install option from the packages tab to install the ‘tidyverse’ package. From the packages tab, click ‘Install’ from the toolbar and type ‘tidyverse’ into the textbox then click ‘install’ The ‘tidyverse’ package is really a package of packages, including ‘ggplot2’ and ‘dplyr’, both of which require other packages to run correctly. All of these packages will be installed automatically. Depending on what packages have previously been installed in your R environment, the install of ‘tidyverse’ could be very quick or could take several minutes. As the install proceeds messages relating to the progress will be written to the console. You will be able to see all of the packages which are actually being installed. Because the install process accesses the CRAN repository, you will need an Internet connection to install packages in this way. It is also possible to install packages from other repositories as well as Github or the local file system, but we won’t be looking at these options in this lesson. was written to the console. You could also have installed the tidyverse packages by running this command directly at the R terminal.